A product of German precision manufacture. Hot filament electrodes in soft glass enclosure (as Neon/Cold Cathode electrodes) for manufacture of luminous tubes. Can be spliced by Neon glassbenders like normal neon electrodes; no ring-seals necessary, so no scientific glassblower needed as for normal fluorescent lamp electrode sealing. Fits almost every application with operating currents from 50 to 700mA. 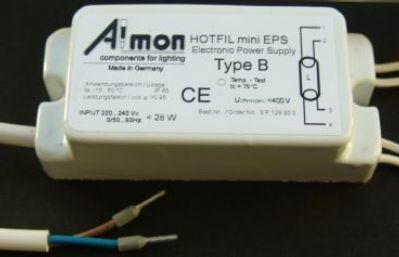 Types A and B preferrably for use with the HOTFIL "mini EPS" Electronic Power Supply. Type C for operating with standard 58 W-ballasts*). 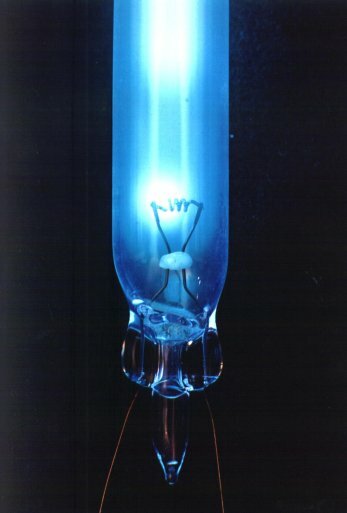 For all tubes with blue discharge (mercury vapor, no Neon). Tubes can also be operated in high voltage series circuits without preheat! Operation of HOTFIL-electrodes on socalled T5-"Multiwatt" electronic ballasts of third party manufacturers (automatic wattage detection) is not yet recommended. Short term destruction of electrodes is possible. 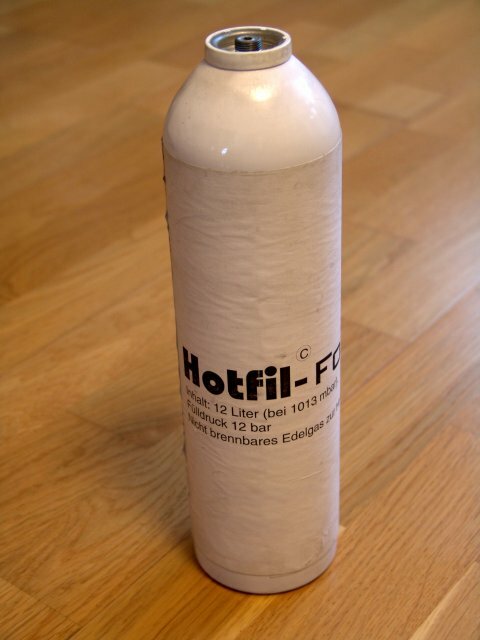 Therefore use only the recommended Original HOTFIL-mini-EPS. *) Electrode type C (equivalent to standard 58 W electrodes) will be available soon. Electrode caps can be supplied fitted to the electrode or loose. Also available: G5 push-on sockets with push-in wire connectors and cable protectors. 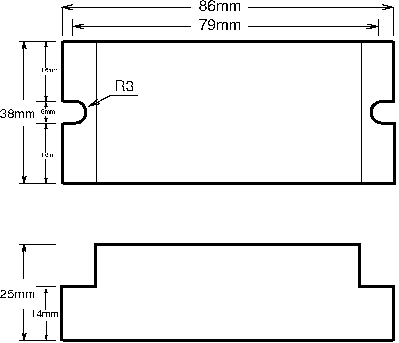 Compact, safe connection to HOTFIL-electrodes with T5-caps. are recommended for additional moisture protection. for operation on "mini EPS"
Important: Always use same type A or B for power supply "mini EPS" and electrodes! Conditioning unit for manufacture of luminous tubes with HOTFIL electrodes in Neon shops without requiring a processing oven (free of license fees). The conditioner consists of a control unit and a high voltage unit. Eight high voltage leads permit the processing (pumping, outgassing, activating etc.) of two tubes of similar dimensions within approx. 15 minutes. 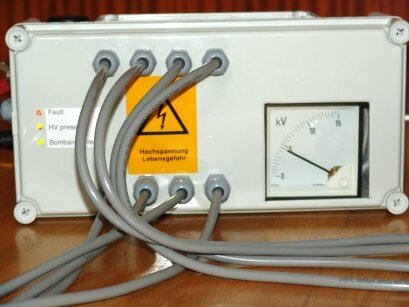 The conditioner can be attached to an existing bombarder/pumping system for Neon/Cold Cathode tubes (see system requirements) within less than 20 minutes. Standard Neon/Cold Cathode tubes can be processed without removal of the conditioner by flip of a switch. The HOTFIL conditioner guides the operator step by step through the semi-automatic process and so requiring minimal personnel training. 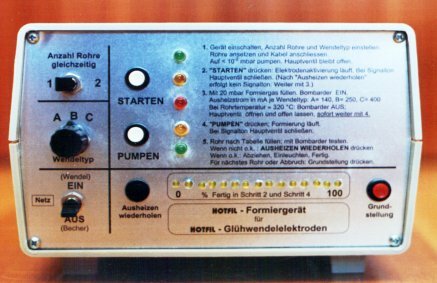 The operator still has constant control over pumping system and bombarder, except for the critical electrode activation, which is controlled automatically. Parameters are checked constantly and error warnings are given by the conditioner. The conditioning unit contains extensive safety provisions and thus -if installed properly- is intrinsically safe in any case for bombarder voltages up to 25kV. Inert gas mixtures with optimal composition for semi-automatic manufacture of luminous tubes using HOTFIL electrodes and HOTFIL conditioner. Electronic Power Supply "mini EPS" with active, regulated PFC (Power Factor Correction) for individually manufactured HOTFIL tubes. Intelligent flicker-free quickstart with tube protection. Automatic shut-off on open circuit, filament breakage, tube breakage, overtemperature and overload. Extremely small - ideal for channel letters. Can be used outdoors without additional enclosure. Constant output current (=brightness) independent on tube length. Installs like standard-fluorescent lamp ballasts. Output voltage less than 1000 Volts, thus no hassle with high voltage regulations. Can be installed by every licensed electrician. The "mini EPS" types A and B are designed especially to fit with HOTFIL electrode types A and B, respectively.